Microsoft is marketing its Surface Pro tablet as a productivity machine, but I'm a hopelessly addicted PC gamer, and have less, well, conventional plans for the hardware. Recent Internet hubbub says Surface Pro holds its own as a gaming device, so I had to validate the claims for myself. $1000 is an expensive entry fee for playing Portal 2 on the bus, so as soon as I could pry the Surface Pro from the other editors' hands, I put it through a battery of real-world gaming tests. Ultrabook-caliber specs suggest Surface Pro might have potential. A current-gen Core i5 processor and SSD could deliver a nice gaming experience, but RAM is capped at 4GB, and the tablet's integrated Intel HD Graphics 4000 would seem destined to disappoint anyone who wants to play anything more graphically challenging than Angry Birds. But enough speculation. Let's look at Surface Pro's real-world frame rates in legitimate PC games. I'll also evaluate how the tablet performs as a touch device in turn-based games, and whether battery life cripples the machine as a mobile gaming platform. First, I crammed a few of my favorite games—each varying in resource requirements and gameplay style—onto the tablet's teeny-tiny SSD. Next I used the free version of FRAPS to benchmark each game for a period of one minute on different graphics settings. FRAPS will report the real-time frame rate of any game, as well as set up custom benchmarks to record the average frame rate over a given period. If a game offered preset high, medium and low settings, I used them. If not, I manually adjusted the settings to meet those basic standards. I also disabled anti-aliasing except for the high-performance tests (in which cases I set anti-aliasing to 2x). In the chart below, you'll see the maximum, minimum and average frame rates that the Surface Pro delivered for XCOM: Enemy Unknown, Portal 2, Minecraft and Civilization 5 (click the image for an exploded view). I was surprised by some of the results. Sure, I won't be maxing out Portal 2 settings, but Surface Pro did get close to 50 frames per second on medium settings. This indicates there's wiggle room to adjust some of your favorite settings to high, and still have Portal 2 run comfortably—unless, of course, anything less than 60 frames per second leaves you unfulfilled. Minecraft ran exceptionally well. For this, we can thank the game's heavy reliance on CPU processing rather than GPU processing. The Core i5 processor rendered the Minecraft environment quite well, and everything ran smoothly near 40 frames per second, even with all the fancy graphics settings enabled. Civilization 5 on low settings is still pretty. The two Firaxis games—XCOM: Enemy Unknown and Civilization 5—mostly chugged along below 30 frames per second, and ended up being pretty choppy but arguably playable. Because these games are basically super-charged board games, their slower turn-based gameplay allowed Surface Pro to catch up, and make up for the frames it dropped. In effect, the hardware's performance deficits were only an issue during cut-scenes, when scrolling around maps, and when processing my opponent's turn. But enough about the small handful of games I put under the benchmarking microscope. My primary objective for this Surface Pro exercise was to find a quality way to play Steam games on my big-screen TV without running a crazy-long HDMI cord from my current desktop behemoth. With the help of Surface Pro's HDMI adapter, I was hoping to play my PC games on the big screen, taking advantage of Steam's new Big Picture interface. 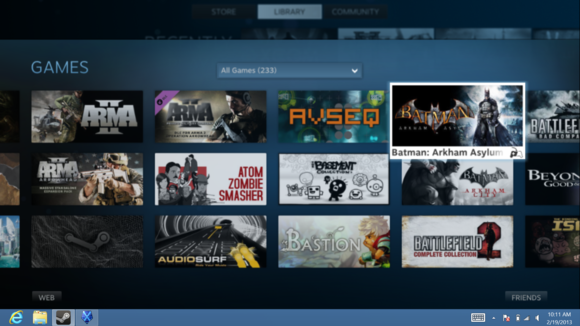 Steam's Big Picture Mode makes it easier to use from the couch. PCWorld's Surface Pro is mated to Microsoft's Type Cover, but the touchpad on that keyboard accessory is hopeless for navigating gaming interfaces, so I grabbed a USB mouse along with my Xbox 360 controller. Just one problem, though: The tablet boasts only one USB port. Shoot, and I was planning to use a gaming keyboard and a USB headset too. Desktop gaming machines come with tons of USB ports for a reason, and without them, the basic gaming experience can be crippled. I grabbed a USB hub and finally managed to hook everything up, but the Surface Pro was now an over-tethered mess with all those cables attached. To test out Xbox 360 controller support, I turned to Super Meat Boy, an indie-developed side-scroller that offers console friendly gameplay. I set the game to Surface Pro's native 1920-by-1080 pixel resolution, and it ran at a stable 30 frames per second, which was a bit too choppy for my tastes due to the fast-paced action intrinsic to the game. There weren't any other graphical options to adjust, so the resolution was all that could be addressed. Regardless, the controller worked well, and I concluded that Surface Pro can be an able platform for playing simple console-style games via Steam. Likewise, loading a few console emulators would be easy and convenient.